Reflection is a core component of many outdoor education programs with many educators relying on journal writing as a means of facilitating reflection. Yet the classic tattered leather journal that has for centuries had aesthetic appeal has a direct competitor that is much more alluring to many students: Web 2.0 technologies, such as Blogs and Voicethreads. The allure is particularly strong for students who have been labeled as "digital natives" and who are known for their expertise with digital technologies compared with previous generations. 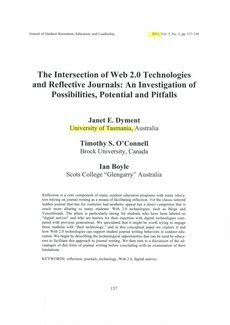 We speculated that it might be worth trying to engage these students with "their technology," and in this conceptual paper we explore if and how Web 2.0 technologies can support student journal writing behaviors in outdoor education. We begin by describing the technological opportunities that can be used by educators to facilitate this approach to journal writing. We then turn to a discussion of the advantages of this form of journal writing before concluding with an examination of their limitations.